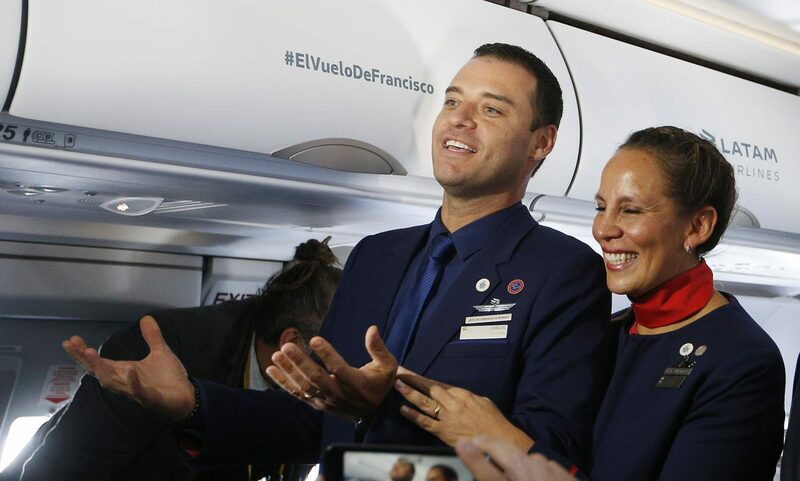 ABOARD THE PAPAL FLIGHT TO IQUIQUE, Chile (CNS) — Love was literally in the air as Pope Francis performed an impromptu wedding ceremony at 36,000 feet aboard his flight in Chile. “I said, ‘Well, yes. Are you sure?’ Then the pope said, “Are YOU sure?’ I told him, ‘Yes! Let’s get married,'” Ciuffardi recalled excitedly. The newlywed said he asked his boss and president of LatAm airline, Ignacio Cueto, to be his best man and one of the Vatican prelates drew up a handwritten marriage certificate. “The pope said it was historic! Never has a pope performed a wedding on a plane!” Ciuffardi said. The pope was on his way from Santiago, Chile, to Iquique before heading to Peru later in the day.